Utagawa Yoshiiku (1833-1904) Ichikawa Kodanji IV as the Priest Mongaku, 1864. Oban. The legend of this famous priest is told in the play, Nachi-no-Take Chikai no Mongaku, (The Priest Mongaku at the Waterfall of Nachi). Endo Morito, a samurai, became besotted by the beautiful wife of Watanbe Wataru. She rejected his persistent demands until one night when she agreed a rendezvous where Morito was to decapitate her husband. She put herself in his place and Morito, recognising his mistake took holy orders (changing his name to Mongaku) and spent three years enduring the harshest penance, eventually praying beneath the Nachi Falls in the freezing winter. At the point of death, he is rescued by Fudo Myo (the Buddhist deity of fire) and by Kannon, the goddess of compassion. Yoshiiku chooses the famous scene where the priest is ready to expire in the icy waters of the falls. 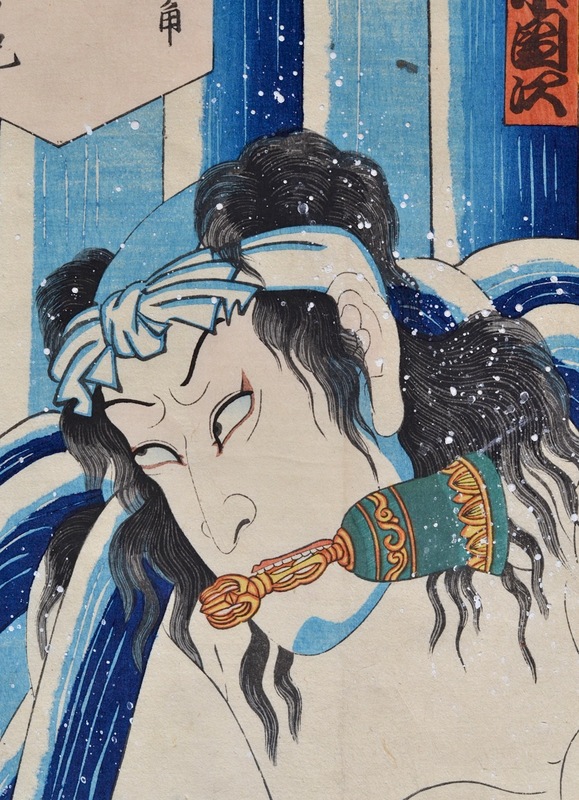 The explosion of the water is a graphic tour de force - the print seems to be chopped and collaged as if the water were some solid material, ready to be reassembled in a piece of modernist sculpture.. Mongaku sits wearing the deluge with a forbidding tolerance, his rightward glance, suggesting the imminent arrival of the compassionate goddess. 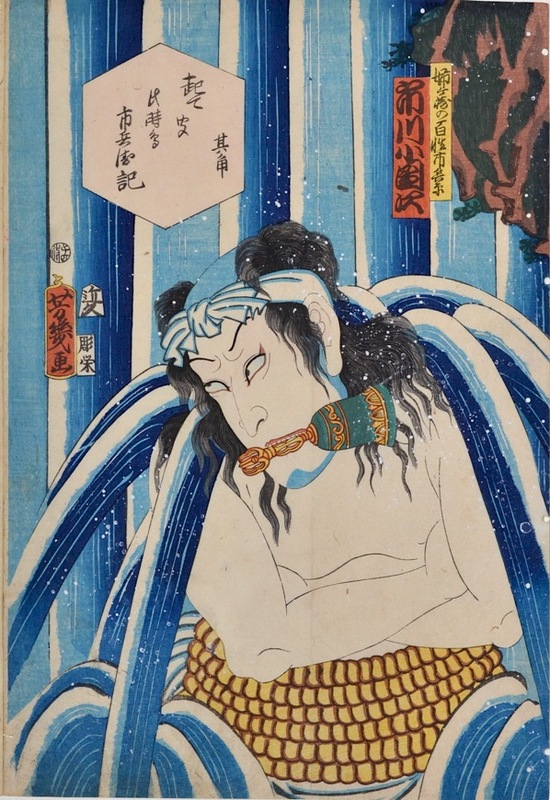 Kunichika, later used this version as a model in his print of the same subject from 1875. The print is stunning… this deluxe version is richly sprayed with white pigment (gofun) to represent the torrential waterfall. The design is bold and abstracted and the drawing is confident and direct. The colour, impression and condition are all excellent. Album binding holes to the left. A copy of this print is in the MFA Boston.